Yeah, so that was one way to start 2012. I just knew it was going to be a good year! And is that not the cutest little peanut you've ever seen!?! Yay yay yay yay yay! Yay. HOORAY! Congrats! I had a feeling something wonderful was happening with you being MIA lately. Yay!! I've been stalking you on thebump hoping for an annoucement very soon. CONGRATULATIONS MAMA! You must be so thrilled. I'm due with my first in July. I can't wait for all your tips and advice, I'm really going to need it! YAYAYA!!! Due date?! details? Well....minor details :) So happy for you! So so happy for you guys! Congrats!!!!! I have been stalking you too. Yeah! Congrats! I was wondering when you were going to "come out". I had a little one in Sept 2011 and accidentally logged on to the Sept 2012 boards and saw your post three weeks ago. So happy for you! Congratulations!!!! How exciting for you! Amazing news!! Praying for a sticky baby and healthy pregnancy for you :) Congratulations!!!!! Congrats! Can't wait to follow your 3rd addition journey! Congratulations!!! That is soooo awesome! I'm so happy for you my friend! Congrats! You just officially sent my baby fever OUT OF CONTROL. Congrats!! So happy for you and the fam! Troy on the other hand might dislike you for the next few months for giving me baby fever! woot woot!!! soooo excited for another newborn baby to grace the blogosphere!! everyone is pregnant i swear... and i LOVE it! Yay!!! Congrats to you and your family! That's so so so exciting!!! Congrat to you guys!! I just squeeled in my cubicle! Congrats from another well wishing blog stalker! Been following you since the bump days and our kids are the same age. Good luck with the pregnancy! Yay!!!! Congrats to you guys!!! What a way to start the new year! I've been waiting for this announcement! Congrats Mama! Im a bump stalker as well, and I got so excited when you mentioned youd be announcing this week!!! The ultrasound looks great! CONGRATULATIONS!!!! Congrats, congrats, congrats. The best WW I've seen yet!! YAY!! Congratulations!!! So exciting. I have been wanting to have another but we will have to see. Awww!!! YAY!! CONGRATULATIONS MAMA!! I'm so excited and happy for you!! Oh wow! So happy for you! Amazing how we can see our babies so little and new. Congratulations!! Oh my goodness!!! SO SO SO happy for you!!! Congratulations! There must be something in the blog water. CONGRATULATIONS! What a great way to start a new year! I want to thank you 4 your nice comment on my blog. If you like the things that I post, please follow! Congrats Jenni! So happy for you and your family! 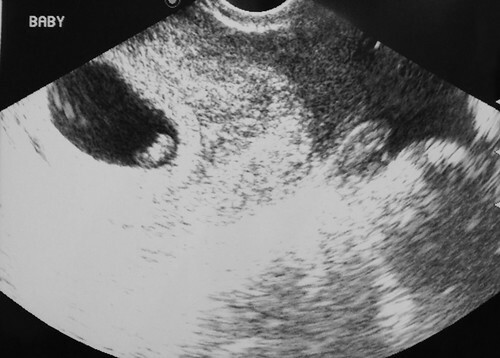 I am pregnant with #2 and can't imagine being on #3, how exciting! Congrats! We started 2012 the same...we are officially 7wks & 1day! Our due date is 9/18/2012, what's yours? LOVE YOUR BLOG! Have been following since you were PG with your oldest ( I was PG with my first too!) Will be prayin for you guys!! congratulations!! i clicked over to your blog and actually gasped when i saw the photo. what wonderful news! Wow congrats! Just found your adorable blog. I'm your newest follower! That is so exciting! Congrats! the best picture yet! congrats to everyone! What a lovely way to announce your pregnancy. Super happy news. Eeeekkk, so happy for you guys! Can't wait to hear the details... congratulations! Hi, thanks for the links up..great day..